So I have replaced the parser with a variant of my parser from my JavaME app. I have also replaced the GUI from the RSS reader and will be implementing a download feature as well as the stream and go to web page features currently available. I have just replaced version on the market with the new version and will wait a few days before implementing the download feature as this will require a permission change and I want people to auto update to the latest UI before I ask anyone to update which I will have to do if I change the permission settings. The code is now on github here under the MIT License so if anyone wants to help out feel free and don't just the code to harshly as I originally wrote most of this app a year or so ago, while overly caffeinated watching a live episode of techsnap. 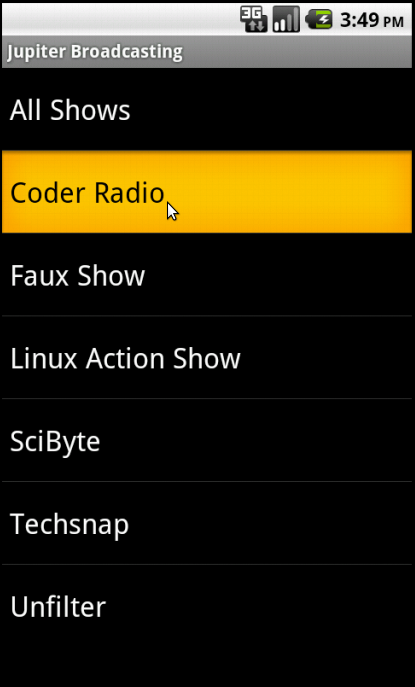 On another note, the app now has a competitor Callisto. Frankly its awesome and choice is always good also since both the apps are free and open source its hardly that much of a competition as either of us could take each others code whenever we pleased. Although I think my license is more compatible with that sort of behavior. Its still in alpha but I recommend you check it out and see which one you like better. I quite liked the in built IRC client in Callisto. Another awesome thing about Callisto is that it supports from android 1.6 up which means it supports older phone that my app doesn't. Unfortunately it also means supporting the live video stream for Callisto is probably not going to happen. However the creation of Callisto might give me the opportunity to change the API version of my app to 3.0 to support the HLS video stream rather than the RTSP stream with the knowledge that my users have somewhere to turn in Callisto. 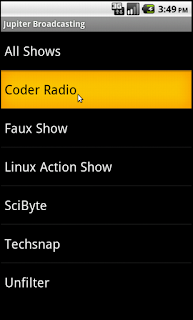 Anyway best of luck to Callisto and its developer, who I have to give mad props to doing this in Android 1.6 as I personally wouldn't have creating my Jupiter Broadcasting app with out the Media API that came in 2.2. Whats Taking place i am new to this, I stumbled upon this I have found It positively useful and it has aided me out loads. I'm hoping to contribute & aid different customers like its aided me. Good job.